Well, what do you know? My oxblood lilies didn’t let me down in the toughest weather year of my life. Sure, it won’t be a blockbuster performance this round. But they’ve seen worse since Scott Ogden notes their Texas foothold in the 1840s. And although my garden’s “in disarray,” shall we say, most of my plants have made it. Browned leaves do blemish the scenery. But every day, I think of the truly burned in the recent fires that have destroyed homes and wildlife. My garden’s been a mess before, but I’m less stressed about it than ever before, too. I worry about the farmers, ranchers, and wildlife. But historically, gardeners are dauntless, like the oxbloods. On tour this week (click the link to watch! ), meet a gardener who embraces a challenge like a warm hug. And that’s what Doris Green will give you if you run into her at an Austin Daylily Society meeting or ANY garden event everywhere. She’ll also hand you a cutting or division from her passalong garden and any advice you need to make it thrive. The grandkids adore the Wizard of Oz daylily path, complete with ruby slippers and a yellow brick road! 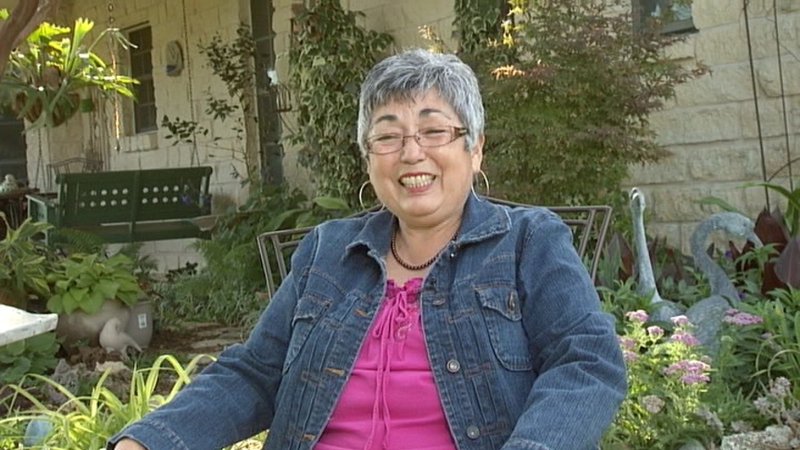 Velia Sanchez, her dear friend and mine, often joins Doris to swap more daylilies and cuttings. I thank Velia, Bob Beyer, and Rose from Las Comadres Para las Americas for connecting us to Doris and her buoyant garden philosophy and practical advice. One of these cool weekend mornings, I’ll be dividing daylilies. Oh, I’ve got lots of plans! My to-do list could wallpaper a room. But for sure, I’m planting garlic again. My first time, I just divided a bulb from the grocery store, and bingo, those few cloves turned into a bounteous harvest that May. Let me tell you: harvesting your own garlic is such a kick! You’ll get excited about garlic too, with this week’s CTG. Sam Slaughter from Gabriel Valley Farms joins Tom to show how easy it is, with varieties that are far more delicious than any from the store bin! If you don’t have a ton of room, or only a few spots of sun, plant them among your perennials for striking winter foliage. Mid-October is the perfect time to plant, so there’s lots of time to amend your beds with woody compost and an 8-2-4 fertilizer. Plant 2” deep and 4-6” apart, depending on variety. In May, when they flower, cut the scapes at the base and head to the kitchen, since everything is edible! 3-4 weeks later, it’s time to dig. For Central Texas, Sam recommends Creole, Lorz Italian, and Turban varieties. Get all of Sam’s tips, including how to dry and store your garlic. Gabriel Valley isn’t open to the public, but look for their certified organic plants at your local nurseries and some grocery stores. Cathy and Sam live and garden here, and know what works. Sam hopes to have his garlic in nurseries next year, but for now, he recommends Gourmet Garlic Gardens if you can’t find bulbs locally. Since we’ll be busy planting food and wildflower seeds over the next 8 weeks, Trisha’s got tips for Success with Seeds. Planting seeds sounds so easy, but many things can befall them, especially if you plant at the wrong depth. And this year, we want that ground good and moist before scattering our wildflowers or rowing up our vegetables. Oh, don’t be shy about including Swiss chard, lettuces, and other fall crops among your perennials, too, if that’s where you’ve got the sun and yummy soil. If you’re not into annuals, it’s a fun way to flavor the dormant perennial garden. And look at this garden bag! Trees have really taken a hit this year. If they aren’t dying outright or self-pruning dead baggage onto power lines, they’re sending out signs of stress. We thank Jennifer Loeffler for sending us this picture of her ornamental peach tree that’s been a victim. As CTG’s Question of the Week, Daphne analyzes whether this is the result of borers or disease. Thanks to Jennifer’s outstanding work as a plant detective, Daphne and other A&M experts determined that this is bacterial canker. There is no cure. The best thing to do is to prune out the damaged limbs and begin a thorough watering and fertilization for the tree. This winter, keep your fruit trees well watered. Daphne’s Plant of the Week is drought-tough Agastache, a true hummingbird magnet. We thank Diana Kirby of Sharing Nature’s Garden for her picture of Agastache ‘Acapulco Salmon & Pink’. She’s had her Agastache for a couple of years, planted in morning sun with afternoon shade. ‘Acapulco Salmon & Pink’ gets about 2.5’ tall and a 1.5’ wide. As a member of the mint family, its leaves are deliciously fragrant. It dies back in the winter but returns in spring to flower through fall. Even though Diana shares her garden with deer, they’ve let her hang onto it. I’ve added agastache to my list, especially since Mary wrote on CTG’s Facebook page about her favorites: Desert Sunrise, Orange Flare, Ava and others. Now, aren’t you getting excited again too? I don’t know if Pet of the Week, Flash the Wonder Cat, gets excited about agastache. But he certainly loves everything about mom Robin Mayfield’s garden at Getting Grounded. At age nine, Flash has been Robin’s design consultant, inside and out, since he adopted her as a 4-month-old stray. His name comes from his incredible speed and dexterity. This serves him well when Robin’s got hard work at hand. But Flash is a true gardener at heart: he’s been known to wade through puddles. Hope he gets some soon! Here’s another great tip on feline garden help, thanks to Kathleen Scott of Hill Country Mysteries. To help her young trees through drought, she punched holes into old kitty litter containers. She fills them with water to slowly soak into thirsty tree roots without runoff. And if it ever rains, she’ll have miniature rain barrels ready to gently disperse water. ← Fall preview + CTG swag!